As the weather finally starts to warm up, I find myself drawn to casting on a new project with something other than wool. I’m always worried that using wool in the hot summer months will make for uncomfortably warm knitting, as well as a felted project. 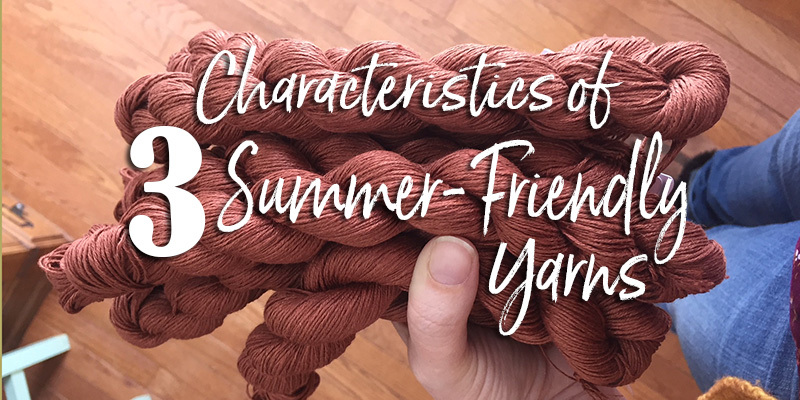 Plant-based yarns like cotton, linen, and hemp are the perfect alternatives to wool when planning your summer knitting. Like wool, plant-based fibers have unique characteristics (and a few challenges) that you’ll want to fully understand to make a great yarn-to-project match. To learn more about working with these yarns, I turned to a spinner—for who better to explain these yarns and how best to draw out their magic, than someone who knows how to spin them? Author, Stephenie Gaustad explores plant-based fibers in great detail in her book The Practical Spinner’s Guide: Cotton, Flax, and Hemp. 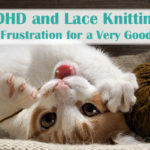 As a knitter, I found her insights immeasurably helpful, and a few stopped me from making some frustrating, uninformed mistakes. The Portico Tank from knit.wear Summer 2019 is made with Blue Sky Fibers Skinny Cotton. Cotton is a seed fiber with many compelling qualities. • Strong—It’s stronger when wet and not harmed by temperatures well above boiling. • Cool to the touch—Cotton is comfortable in warm weather because it readily transfer’s heat away from the body. • Absorbent—It has excellent moisture-wicking qualities. • Easily cleaned—Cotton can be washed until clean with soaps and detergents. • Lacks elasticity—that’s the springy bounce you feel with wool fibers. • Won’t full—if you think cotton will bloom, think again. The Linum Tee is knit with Quince & Company Sparrow, a 100% linen yarn. Linen yarns are spun from flax. To understand knitting with linen, you need to know about flax. It has nearly all the same qualities as cotton, above, along with a few that are unique to it. • Strength—It’s the strongest natural fiber. Don’t try breaking the yarn with your fingers, use scissors. • Absorbent—Flax is even more absorbent than cotton! • Vulnerable to low humidity—Too long in a hot dryer will injury your linen project (though, it won’t have felted!). • Finer after washing—The loss of waxes, pectin, and gums in the spun fiber during washing will make a stiff linen fabric becomes leaner. Expect the drape to change after washing a freshly finished project. 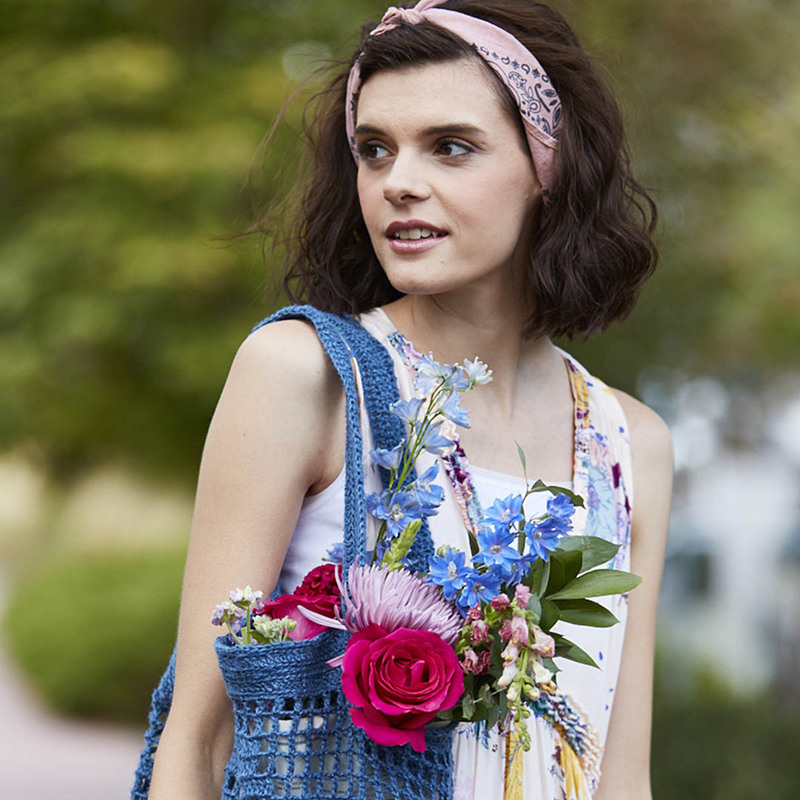 The To Market Tote is a fabulous bag crocheted with Fibra Natura Java, a 100% hemp yarn distributed by Universal Yarn. Clouded with confusion and controversy, hemp is an amazing fiber once called “King of Plant Fibers.” It’s worth noting, hemp yarn is spun from Cannabis sativa, which has very little of the controversial chemistry of Cannabis indica. And hemp fiber, yarns, and fabrics are all perfectly legal. • Resistant to rot and salt-water damage—This is why sails on ships are often made with hemp canvas. • Abrasion resistant—So it won’t pill and it’s great for rugs, bags, belts, cords, ropes, etc. • Sensitive to acid—don’t spill tomato juice on your FO, it will cause serious damage. Knitting with cotton, linen, and hemp has advantages. The yarns’ sterling attributes include the fact that they won’t shrink or felt when you wash them, won’t pill, and won’t attract moths. In addition, these yarns take a lot of hard wear and show little change, much less damage. Yet, some knitters balk at using them. Let’s look at why. As wool knitters, we’re used to knitting with elastic yarns. That doesn’t mean that we should only knit with springy stuff. Firm yarn can be just the thing for a sturdy market bag or breezy summer tee, for example. Unlike their woolly counterparts, cotton, linen, and hemp yarns are flat. Lean and lustrous, linen and hemp yarns highlight fabric architecture. They make stitch patterns “pop”; each stitch stands out in a clear statement of structure. Even the misshapen stitches. Look for projects with interesting knit/purl stitch patterns, or try knitting lace with these yarns. Freshly spun, these yarns are wirey and stiff, but when washed or boiled, linen and hemp becomes much softer. After they’re manipulated and beetled, they soften even more. With each laundering, they’ll lose stiffness. Have a favorite cotton tee? 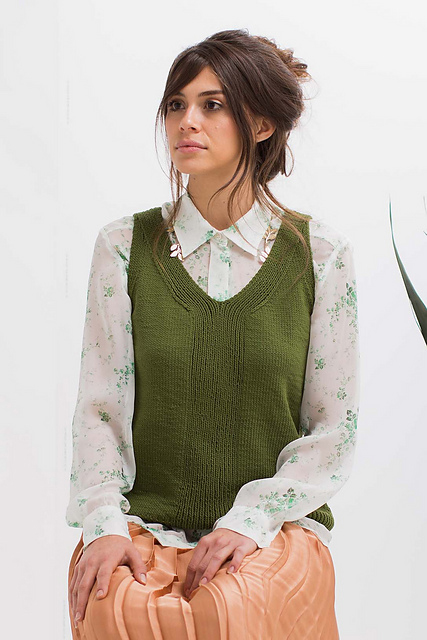 You could have a favorites hand knit linen top too. After you bind off the last row of cotton, linen, or hemp yarns, you’ll want to work in the loose ends of yarn before you assemble the pieces. Then, you’ll need to relax the stresses imparted by the knitting. It will be much easier to assemble a finished piece if you block the pieces before seaming. The Strafford Tee calls for Elsebeth Lavold Hempathy, a cotton/hemp/modal blend. Armed with these plant-based fiber insights, I feel ready to tackle a new project knit with linen. I really love how soft linen becomes with each washing, and how it shows off lace patterns in beautiful detail. I think I’ll invite my knitting gals over for an evening of summer knits and drinks on the deck. What’s your favorite plant-based fiber to knit with? Share in the comments below. Note: material shared in this post originally appeared in Stephenie Gaustad’s book, The Practical Spinner’s Guide: Cotton, Flax, and Hemp.